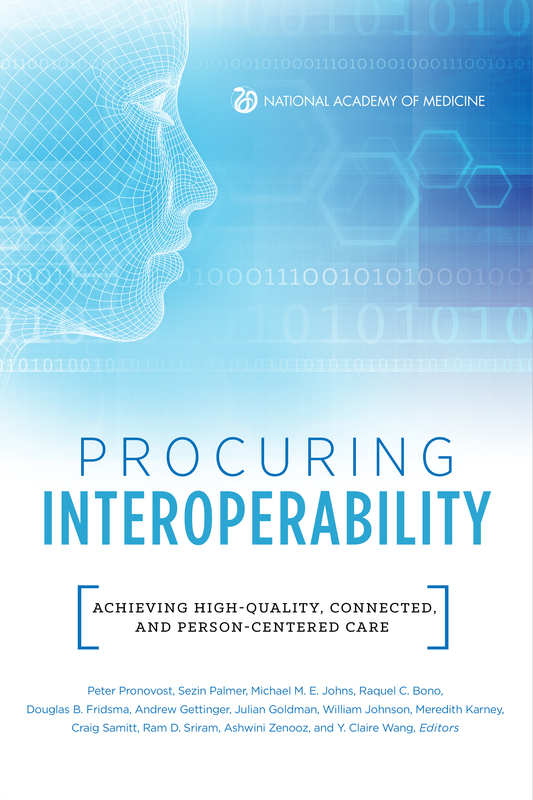 The Procuring Interoperability publication release webinar has been rescheduled for April 16, 2019 from 3:30 – 5pm EDT. Please register to attend! With funding support from the Gordon & Betty Moore Foundation, this National Academy of Medicine Special Publication represents a multi-stakeholder exploration of the path toward achieving large-scale interoperability through strategic acquisition of health IT solutions and devices. In this publication, data exchanges over three environments are identified as critical to achieving interoperability: facility-to-facility (macro-tier); intra-facility (meso-tier); and at point-of-care (micro-tier). The publication further identifies the key characteristics of information exchange involved in health and health care, the nature of the requirements for functional interoperability in care processes, the mapping of those requirements into prevailing contracting practices, the specification of the steps necessary to achieve system-wide interoperability, and the proposal of a roadmap for using procurement specifications to engage those steps. The publication concludes with a series of checklists to be used by health care organizations and other stakeholders to accelerate progress in achieving system-wide interoperability.